a series of individual speakers in Q&A sessions, with no set talk but fielding questions from their audience. Was Stephen Hawking Right: Should We Not Broadcast to Extraterrestrial Civilizations? Multiverses: Is One Cosmos Enough? Pluto Politics: Should Pluto be Considered a Planet? Why	Are There No Tourists from Other Worlds? Asteroid Armageddon: Will The Kind of Rock that Obliterated the Dinosaurs Get Us Next? Should Humans Explore the Moon and the Planets or Do We Leave it to Robots? Is Doomsday 2012 For Real or Will you Still Have to Pay Taxes in 2013? Do We Have to Learn Klingon: How Will We Communicate with ET? Secrets of the Red Planet: What Have We Learned from Mars Exploration? The conference costs $25/day or $35 for the weekend, and includes a Friday night “RockBand” party MC’d by Phil Plait. 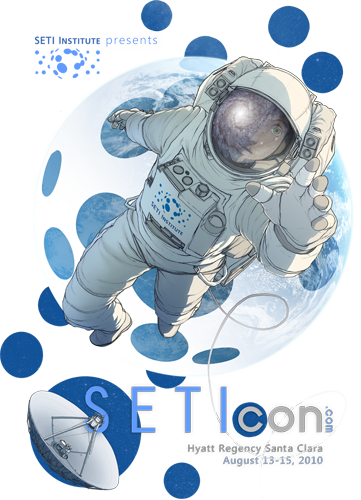 For more information and the schedule of programs, visit the official SETIcon website.